Lawyers’ Professional Indemnity Company (LAWPRO) is committed to excellence in serving all customers, including people with disabilities. We will ensure that individuals who deal with the public on our premises and on our behalf receive training in connection with assistive devices, if any, on our premises that may be used by customers with disabilities while accessing our goods, services or facilities. A person with a disability who is accompanied by a service animal will be allowed to have that service animal accompany them on our premises. In the event of a temporary disruption to services or facilities usually used by customers with disabilities, LAWPRO will notify such customers promptly. This clearly posted notice will include information about the reason for the disruption, its anticipated length of time, and a description of alternative facilities or services, if any, that are available. 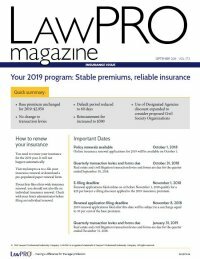 The notice will be placed at 250 Yonge Street, Suite 3101, Toronto and on LAWPRO’s applicable websites or otherwise as is reasonable in the circumstances. LAWPRO will provide training to all of our employees and volunteers, and any other person who provides goods, services and facilities on our behalf, if any1. This training will be provided to the applicable persons as soon as practicable. What to do if a person with a disability has feedback with respect to accessing LAWPRO’s goods and services. Customers who wish to provide feedback on the way LAWPRO provides goods, services and facilities to people with disabilities or whether our process properly provides for the provision or arrangement of accessible formats and communication supports can contact us in person, by phone, fax, regular mail or email. All feedback will be directed to Stephen R. Freedman, General Counsel & Chief Privacy Officer. Customers can expect to hear back within 30 days if a response is requested. Complaints will be addressed according to our organization’s regular complaint management procedures. Any policy of LAWPRO governing the provision of its goods or services to people with disabilities that does not respect the dignity and independence of such people will be modified or removed. 1 This does not include training for individuals employed by another organization that is governed by the customer service standard under the Accessibility for Ontarians with Disabilities Act, 2005. NOTE: The documents required by the Customer Service Standard under the Accessibility for Ontarians with Disabilities Act, 2005 (i.e. the above) are available upon request.